Fishtank Friday: Spacearium | OhGizmo! By Evan Ackerman on 04/11/08 • Leave a comment! 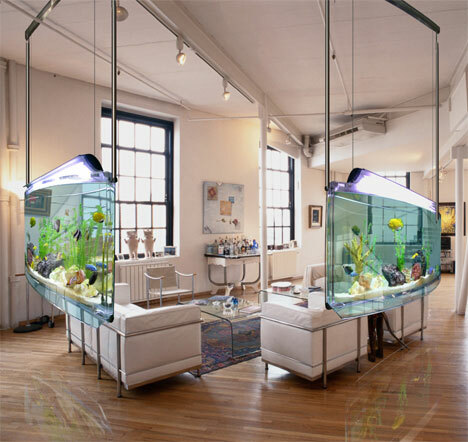 The Spacearium fishtank is intended to “reinvent your indoor space,” as opposed to just being an accessory with some fish in it off in a corner somewhere. The huge acrylic tanks are shaped like gently curving ellipses, and range in size from 5 to 8 feet across, which is easily large enough to turn them into room dividers. Although you can get them with floor stands, it’s much cooler to mount them from your ceiling, since the mounting rails hide two tubes which circulate water (fresh or salt) through a filter system hidden away up to 15 feet away in a wall. The 8 foot tank is about a foot think and holds 73 gallons. It’ll cost you $8400, installation not included.